U.S. brokerage sales volume in September was 4 percent lower than the previous September, but 10 percent higher in total price paid, as 2,367 boats sold for $286.6 million. The results were broadly similar to those of the third quarter this year — total value rose 10 percent as volume declined by 2 percent, according to YachtWorld member brokers reporting in SoldBoats, their proprietary database. During the quarter 8,613 boats changed hands, 174 fewer than the 8,787 that sold in the same quarter last year. The total price paid was $962.5 million, an increase of $90 million from the $871.9 million that was paid the year before. The bulk of the market value gain during the quarter was attributable to the $142.8 million that was paid for 40 superyachts (80 feet and longer), a figure that was sharply higher than the $59.6 million that was paid for 38 superyachts during the quarter last year. The average price paid jumped from $1.6 million last year to $3.6 million this year. The rest of the value gain — $7.3 million — came in much smaller increments in sales of boats 45 feet and shorter. In fact, fewer boats were sold during the third quarter in the two highest-volume categories: Sales of boats 26 to 35 feet were down 3 percent, and sales of boats under 26 feet were down 1 percent. The other high-volume category, boats from 36 to 45 feet, reported level sales. Yet all three segments showed increases in the total price paid and the average price paid. In the 26- to 35-foot range in particular, despite 104 fewer boats sold, the aggregate value of sales was $200.4 million, an increase of $6.5 million, and the average boat sold for $60,700, up from $56,900. In contrast, sales of boats from 46 to 55 feet were down 4 percent and the total value slipped from $145.5 million to $144.1 million. And among boats from 56 to 79 feet, the sales volume declined 8 percent and the total value was down by $2.8 million. Yet even in those two categories, the average prices increased by 4 percent to 6 percent. 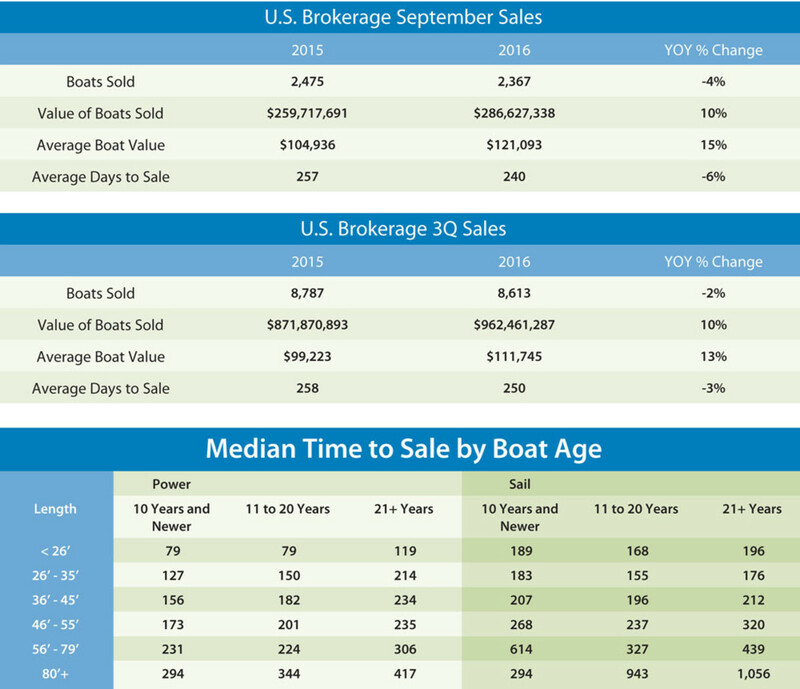 For this month’s story we created an extra report to help answer the universal question of boat sellers: “How long will it take to sell this boat?” The data in our table show the median time required to sell powerboats and sailboats of different ages. We often publish data on the average time required to sell a boat, which can be skewed by extreme cases at either end, as well as by small sample sizes. A median time provides a norm, and as the seller it’s up to you to decide whether your boat fits the norm. Among powerboats, the data show that with age and length, it takes longer to sell a boat. The only exception is among boats from 56 to 79 feet, where a boat that is 11 to 20 years old may sell a little faster than a newer boat. Overall the median sale time for powerboats is shorter than for sailboats; the exception to this is for boats 26 to 45 feet that are more than 21 years old. Among sailboats, we see a different pattern. In all segments below 80 feet, boats 11 to 20 years old sell more quickly than newer boats. Given that relatively few sailboats were built in the past 10 years, compared with previous decades, this would appear to defy conventional marketplace wisdom that recent models are scarce and sell quickly. The conventional wisdom may be right in the case of some of the boats on the market, but clearly the median time to sale is greater for newer boats.